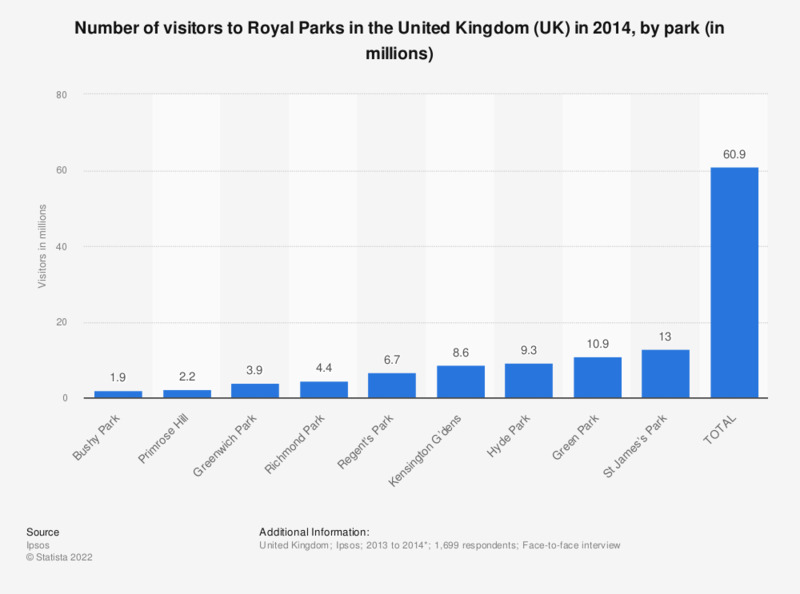 This statistic shows the number of visitors to Royal Parks in the United Kingdom (UK) in 2014. A total of almost 61 million visitors came to the Royal Parks that year. The most visited park was the St. James's Park, with 13 million visitors. * Data combined from waves 2 (covering 22 February to 23 May 2014), 3 (covering 24 May to 22 August 2014) and 4 (covering 23 August 2014 to 22 November 2014). What types of information, activities or facilities, if any, would you like this park to offer? Thinking about your visit today, how much do you think you and your group will have spent in total on . . . .? What did you do when you visited this park today? How would you rate the quality of the park overall? How you would rate each aspect of the park? Which sporting activities do you plan to pursue during your vacation in your holiday home?